So it’s our wedding anniversary today. Our relationship has been tested to its limits, time and time and again during our time together. Probably not much different to other adoptive couples! 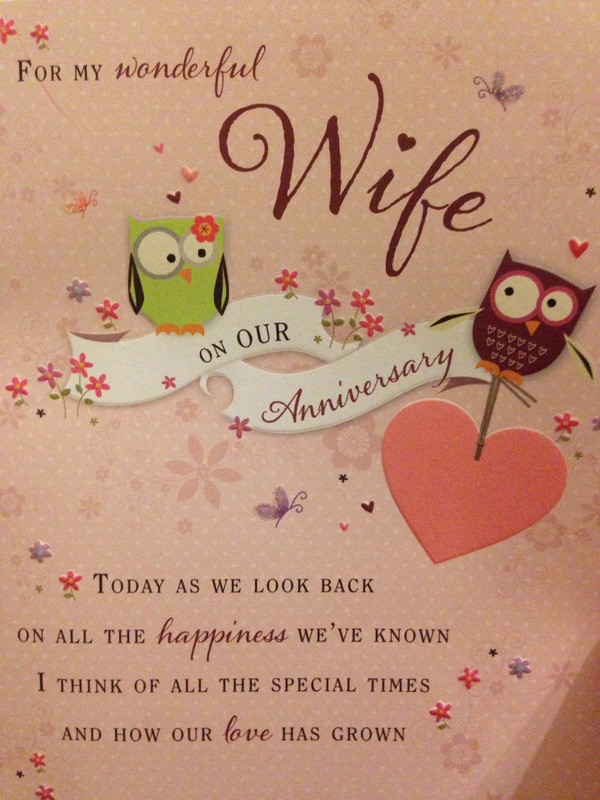 However I insist we always buy each other a card and recognise the day, even if we don’t manage to do much else. As I opened my card this morning Safedad was sat grinning. As I read through all the mushy phrases (which I could have re-written with much sarcasm) I wondered what it was going to say. I’m sorry our life is so crap at times. Sorry we don’t get relaxing holidays. Sorry we don’t have a nice car. But it’s great to be married to you! On top of that, he’d only written “happy birthday” instead of happy anniversary because one of the adorable children was stressing at him whilst he tried to write it. You gotta get the laughs where you can! I went to the Open Nest conference at the weekend. Its a good job I didn’t have far to travel because on Saturday morning I nearly didn’t go! I was feeling that I had quite honestly become so fed up with the whole adoption thing. Strops, rages and violence at home, same at school, meetings with school telling me she should “do as she is told”; meeting with social workers who came to “see if it was adoption breakdown or child protection”!!!! Police checking in with in after the run away. It’s just never ending. So honestly, the only reason really I went to the conference was because my lovely friend (who lives miles away from me and who I haven’t seen for ages) was going too. Arrival wasn’t great! My first encounter was to be blanked by a SW who used to hug me! Clearly she was aware of visits of colleagues but there was no need to be rude! I met my lovely friend and had quick catch up. Then we went into the conference and ended up on a table at the back. I still wasn’t sure I wanted to be there. I didn’t really know what to expect. Did I want more of PACE, do this, try that? I tried to keep an open mind. On introduction there was a mention of keeping updates on Twitter using #takingcare. Well I usually write down quotes and bits and pieces of interest so instead I got my phone out and opened Twitter. To be honest (I now realise) I was also using that to keep my distance, to dissociate myself from the conference, from the topic of adoption. It was my subconscious attempt to keep myself sane and safe. So I began tweeting. I did feel a bit like a naughty child at the back of the class! Yet, my previous life as a PA, fast typist and minute taker came in handy!! I ended putting out a stream of quotes and comments all day. However, my reason for being fed up with adoption is that it feels nothing has changed in 7 years since my girls were place. No change in 10 years since we started our journey. I was kind of shocked but really not surprised that Amanda Boorman’s brilliant film showing their 15 year journey was the same or similar as ours. It’s just not right! That’s also the reason I withdrew from social media for a while earlier this year. I withdrew in order to be #takingcare of myself. At the time there were all those TV programmes showing other people on the adoption journey saying the same things I did and no-one correcting them; no-one teaching them reality. On one of those TV programmes I saw adopters (considering a match with an FASD child) saying “we would not know what illness or difficulty we might have with a birth child”. Years ago I also said that!!! I wanted to rationalise and normalise the issues adopted children come with. Yet, here’s the truth …. We would not have a child with attachment issues. We would not leave them hungry, cold, alone or scared. We would not have a child traumatised or hurt. We would not have a child with drug or alcohol issues when born. We would not neglect our children. We would not leave them with strangers or openly invite people in to abuse them. When are adopters going to be told honestly, openly that actually these children are damaged? Just the very fact that they have been removed will have a lasting effect on these children. Come on people! We need open, honest conversations. It will not scare adopters away! Those open honest conversations and presentations happened at the wonderful Open Nest Conference (http://theopennest.co.uk) and even more so at the Adoption Social (theadoptionsocial.com) evening which followed. It was worth every minute. I’m so glad I went in the end! For that, Amanda Boorman, Sarah, Vicki, Al Coates, Sally Donovan, Fran Proctor, I thank you.